Because the Bit is home from school this week, I’ve been stockpiling a few new/different things for her to play with that will keep her entertained without having to be out of the house all day long. I took a trip to Deals (which is sort of a dollar store, but they have stuff that’s more than a dollar, too) last week and picked up some fun things: sponges in different shapes, a Curious George puzzle in a metal lunchbox, a sort of top-looking thing you can put sidewalk chalk in and have it spin all over the sidewalk. But the best thing of all only cost a buck and has already provided us with lots of fun. I love this face. Pure joy. Sure, I could have made a big bubble wand, and was even thinking about doing so (and may yet in the future). I even pinned a giant bubble solution recipe from Busy Kids = Happy Mom, though I haven’t tried it out yet. 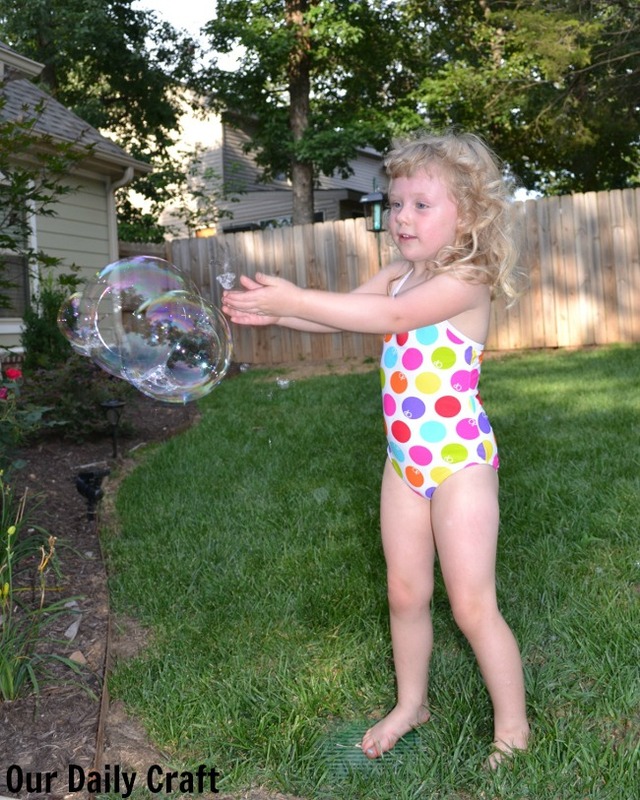 Our bubbles came out just fine using our regular homemade solution (see recipe below). A new bubble wand and a few adults to play with kept the Bit entertained for I’m guessing half an hour or so last night, and another 10 or 15 minutes today. That’s pretty good stuff. So are these adorable pictures. It’s hard to catch bubble and Bit together, but I tried for about 10 minutes, then I walked away from the camera and rejoined the fun. Let this serve as a message to all you documenting-crazy moms that you need to be in their memories, too, and not just as the person behind the camera. I made some more bubble solution last night and we blew so many bubbles we’re just about out again. The good news is, it’s super easy to make. The only thing you might not have in your house that you need is liquid glycerine; I got mine at Hobby Lobby on the soap making aisle. This recipe is from Steve Spangler Science, and though it says you have to let the solution cure overnight, we usually don’t. If you wear knit gloves while you play with them, you may be able to catch one! I like to mix this up in a glass measuring cup with a spout. Stir gently and pour into whatever bottles need more bubble mix. You could certainly make it in bulk if you don’t want to have to make it every couple of days. I store extra in a Mason jar. 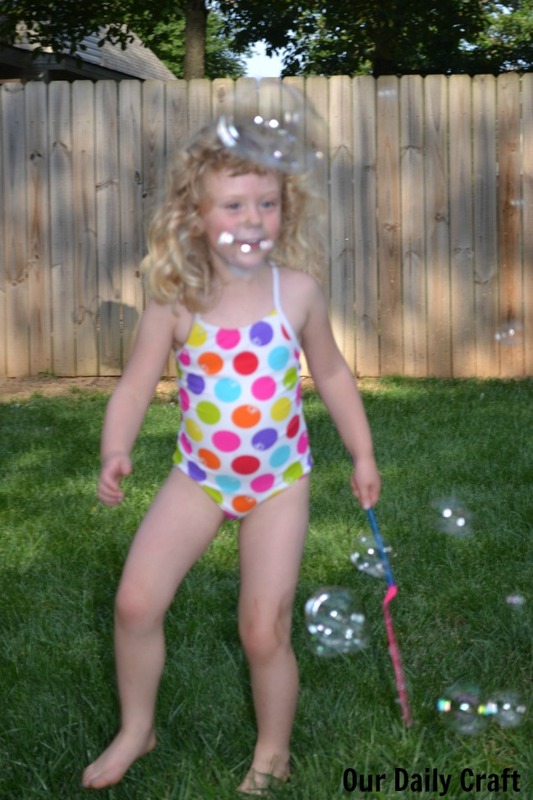 What activities are your kids loving this summer? I’d love to hear about it!